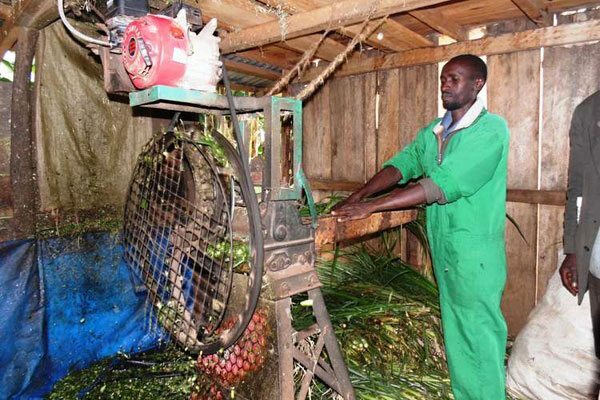 Biogas Use in Kenya: Kenneth Kemei whose farm is in Sonokwek village in Bomet Central Constituency, has remodelled the chaff cutter that used to be powered by petrol to run on biogas that his cows produce, keeping his cost of production lower. The farmer borrowed the idea from a firm that specializes in biogas machines in Karen, Nairobi when he visited last year. “There were so many items on display but what captured my attention was the generator that runs on biogas,” he says. Back on his farm, he figured out how to turn his small petrol-powered chaff cutter to run on biogas that he was generating. While using petrol, he would spend at least Sh100 a day on fuel to chop enough food for his four Friesian cows that offer him 20 litres of milk each. He sought the help of his neighbour, a trained motor vehicle mechanic who has specialised in the repair and maintenance of petrol engines. The work involved extending the fuel pipe from the tank and then putting a valve that controls the flow of petrol into the machine’s engine. The two then introduced the methane gas pipe into the chaff cutter’s carburettor. He realised that he could introduce a valve to control the amount of gas in the engine, thus, regulating the speed of the chaff cutter. This valve helps him use less gas when chopping fresh fodder, which is softer, and thus can be cut as the machine rotates slowly. However, when chopping dry material that is often harder, he increases the amount of gas, which doubles the speed of the engine and hence the power. “The engine is ignited using very little petrol and once it is running, the gas valve is opened as the petrol is cut off until the next ignition session,” Kemei says. The litre of petrol that Kemei used per day now lasts for close to two months. The farmer says he learned how to generate his own biogas three years ago from Self-Help Africa, an NGO then based in Kericho. The institution helped him construct a 12 cubic metres biogas digester that now provides him cheap renewable fuel. Desulphuriser is a special filter that removes the sulphur in the methane that would otherwise react with the iron used in making the cylinder, thus, corroding it. However, he notes that there are special chaff cutter engines that are designed to run specifically on biogas. Thus, he advises farmers to go for them since not everyone can modify petrol engines.